TJC speech and debate team members are (from left): Daniella Juarez, Mesquite; Michelle Lopez, Mesquite; Mackenzie Clayton, Van; Zach White, Buffalo; Carson Moreland, Hughes Springs; Nick White, Dallas; Laurel Maynard, Tyler; Ivory Smith, Dallas; Johnny Vasallo, Mesquite; and Taisia Wamsley, Arlington. 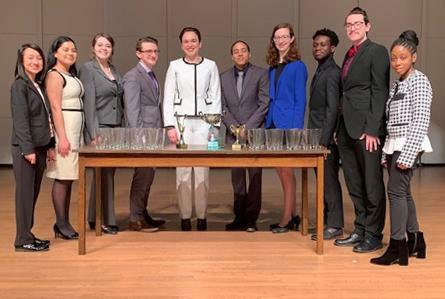 Tyler Junior College swept the Texas Community Community College Forensic Association’s State Tournament this past weekend, taking first place in all three categories: debate, individual and overall. The competition was held Jan. 25-27 at San Jacinto College in Pasadena. Hindman also highlighted team captains Carson Moreland of Hughes Springs and Nick White of Dallas, who won first place in each of their events. In addition to Moreland and White, team members include: Mackenzie Clayton, Van; Daniella Juarez, Mesquite; Michelle Lopez, Mesquite; Laurel Maynard, Tyler; Ivory Smith, Dallas; Johnny Vasallo, Mesquite; Taisia Wamsley, Arlington; and Zach White, Buffalo. For more on the TJC speech and debate program, go to TJC.edu/speech.